The victorious Allies seized all of Germany’s large warships at the end of World War One. After the Washington Treaty of 1921 stated Germany should be allowed to build warships up to 10,000 tons for defensive purposes, the German Navy designed a new type of warship classed as a pocket battleship. The first of these ships named Deutschland entered service in 1933, 4,000 tons over the treaty recommendations. The second ship in this class Admiral Scheer entered service in 1934 and a third Admiral Graf Spee followed in 1936. The outbreak of World War Two saw Graf Spee assigned to operate in the South Atlantic. Between September 30th and December 7th 1939, Graf Spee sunk nine Allied cargo ships. On December 13th, the three British cruisers Ajax, Achilles and Exeter made an attack on the German raider. All of Exeter’s 8-inch guns were destroyed early in the battle, this forcing her captain to set a course for the Falklands to undergo repairs. Even though two of Ajax 6-inch guns were knocked out, her crew continued to fight on. 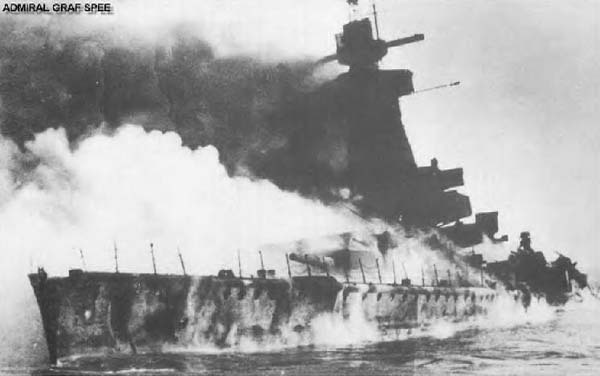 Relentless attacks by the British ships forced the captain of Graf Spee to make a run for Montevideo to undergo repairs. With Uruguay having declared a state of neutrality in the war, they granted the German’s three days to make repairs before leaving. Captain Hans Langsdorff of the Graf Spee received false information at that time leading him to believe the two remaining cruisers had been joined by capital ships. Just as it looked like Graf Spee was about to leave port and make a run for safety, her crew set of a series of explosions to scuttle their ship at the entrance of the port. Below, Graf Spee after being scuttled in Montevideo Harbor. Below, Admiral Scheer was mainly used to attack convoys crossing the Atlantic and Norwegian seas during World War Two. This was one of Germany’s more successful warships credited with sinking around 20 Allied ships. British aircraft sunk her at Kiel April 9th 1945. Below, Deutschland’s name was changed to Lutzow after the outbreak World War Two. Hitler took this decision to prevent a ship named after his country from being sunk. The German Navy also used Lutzow to attack convoys crossing the Atlantic and Norwegian seas. As with many other German warships, Lutzow seemed to be ineffective during the war as she only managed to sink a few supply ships. Hitler was furious with his navy’s performance accusing the navy chiefs and captains of being over protective of their ships. Lutzow was the last German capital ship to be sunk when she succumbed to Allied bombers at Swinemunde April 16th 1945.